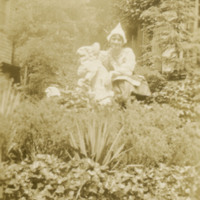 A student is pictured outside on the lawn, wearing a white cap and holding on to a gargoyle. In the background is a building covered in ivy. Photo of M. Carey Thomas on the steps of what appears to be the deaneary. 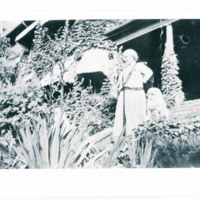 She is standing next to two garden gnomes (one on each side) and a lush amount of vegetation surrounding her.